The headphones and earbuds we all seem to be sporting these days may help us keep up to date on our favorite music, but they aren’t doing our ears any favors. Pumping sound waves directly into your ear can lead to hearing loss – some of which may not be detectable for years to come. Ear buds which fit in the ear canal can trap and promote the growth of bacteria. 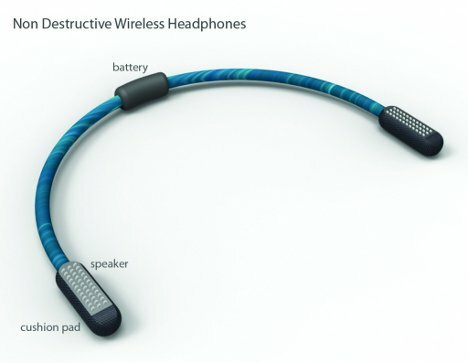 The Non-Destructive Headphones concept from designer Altamash Jiwani would let you listen to your music privately without destroying your hearing or promoting ear infections. 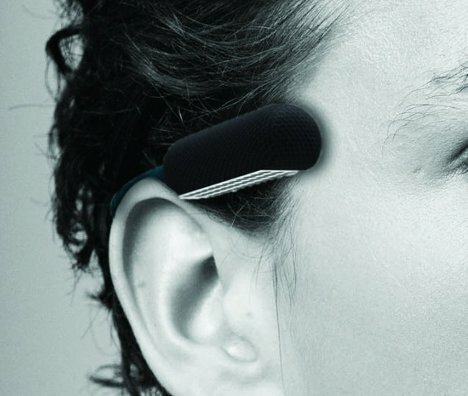 The wrap-around design has the sound-emitting part of the headphones sitting just above, not inside, the ear. According to the designer, people around the listener would not be able to hear the music unless they were uncomfortably close. The listener, however, would still be able to hear everything going on in the surrounding area, a fact that could help music lovers stay safe by alerting them to traffic and conversations around them. See more in Audio & TV or under Gadgets. December, 2011.